Pakistan's television industry has been thriving over the past couple of decades. Its cinema, however, has only recently come of age. As the South Asian nation is now looking for joint productions with other countries, what better option could there be other than its time-tested friend China. The first on the cards is "The Journey," an upcoming movie that focuses on international trade cooperation under the China-Pakistan Economic Corridor (CPEC), of the Belt and Road Initiative (BRI). This topic is all the more relevant since CPEC has brought Pakistanis and Chinese closer than ever before. Announcing the plans, director of the script writing committee of the China Television Artists Association, Wang Haiping, revealed that the film will be based on real-life stories and will highlight the intimate friendship of the people from the two countries. 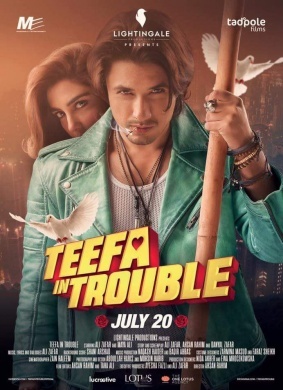 At the recently concluded Silk Road International Film Festival (SRIFF), Pakistan participated for the first time with the film "Teefa in Trouble." Producer of the film, Ali Zafar, pitched for expanding multilateral film cooperation in a conference chaired by Miao Xiaotian, president of the China Film Co-Production. Pakistani media has reported that Ali Zafar is currently working with Chinese film industry leaders to chalk out a strategy for a joint framework. The SCO Film Festival has also helped introduce Pakistani films to Chinese audiences. Five were screened at the festival held in the middle of this year and "Punjab Nahi Jaongi" won the Jury Special Award at the grand closing ceremony. Although a cultural agreement between Pakistan and China was signed in 1965, more recently has there been a focus towards intensifying the exchanges. In a meeting between Pakistan's Minister of Information and Broadcasting and China's Minister of Culture and Tourism in February this year, an executive program of the Cultural Agreement for 2018-2022 was signed which holds immense potential for bridging cultural and language barriers. Pakistani Prime Minister Imran Khan is visiting China in the first week of November to attend the China International Import Expo (CIIE). The high-level exchange serves as a chance for the entertainment industry to also make use of the visit and get the ball rolling for teaming up in this field. Apart from government to government contacts, the people of Pakistan and China share common values that are embedded deep into their cultures. Their customs are derived from strong familial cords, mutual respect and close adherence to traditions. Through films they will be able to further understand one another, gain from each other's heritage, and strengthen their bond of friendship which has transcended all challenges of history. With the launch of CPEC, several economic openings with China have become available for Pakistanis. As a result, mandarin learning furor in Pakistan is in full swing. This growing mandarin audience offers opportunities for Chinese filmmakers which can be utilized not only for enhancing ties but also for commercial purposes. The same is true for Pakistani filmmakers intending to build on the vast Chinese film market. Considering the historic affinity of Chinese people for Pakistan, Urdu movies subtitled or dubbed in Chinese language are bound to succeed. Increased revenues from China will ensure commercial growth for Pakistani filmmakers and ultimately improve production qualities. A way forward is to undertake multi-layered collaborations. Foremost should be close coordination between cultural and film authorities of the two countries. Continued interaction between Pakistan's Ministry of Information and Broadcasting and China's Film Group Corporation will ensure that both are on the same page when launching joint projects and facilitating private investors. Regular communication between film producers will allow them to discern new perspectives and frame products accordingly. They will be able to learn from each other's proficiencies and benefit from the facilities and locations available to either counterpart. Avenues for such employment include the advanced special effects expertise of Chinese post-production artists and on-location filming at the scenic terrain of northern Pakistan. Initiatives from the private sector are important in this regard. Investors and producers will have to be forthcoming if they want to improve their film content and expand their revenues. As frequency of partnerships will increase, so will their scope. Lastly, interaction between media students will add unique dimensions to their learning processes. A fresh cultural outlook or an unconventional approach is always good to pick up in creative disciplines like filmmaking. They should work side by side with each other through student exchange programs as well as scholarships. Cooperation between Pakistan and China in the domain of entertainment had been stagnant for some time. Now that the ice has melted, the technical prowess of Chinese filmmakers and ingenuity of Pakistani producers can be fully used for mutual betterment. State-owned and private entities should both come forward and take advantage of this untapped arena.